December is the best month of the year in Bogotá. The days are sunny, warm and bright, the nights crisp and clear, and at 9,000 feet the light vibrates with burning intensity in the thin mountain air. For a few miraculously cloud- and smog-free weeks, it is even possible to see on the horizon the Andean ranges that encircle this capital city. December is also a time when people everywhere put down their tools and devote themselves to celebrating the festive season with tropical intensity. In the midst of their troubles, Colombians retain a zest for life, an ability to seize pleasure from the fleeting moment that is one of the attractions of this endlessly complex and contradictory country. This year, however, the holiday spirit has been submerged by an undertow of dread. Carlos Castaño, Latin America's most feared death squad leader. so. First, there is the Colombian government's failure to confront the enemy within. The moral corruption within the Colombian armed forces has permitted the phenomenal growth of the paramilitaries, eroding the legitimacy of President Andrés Pastrana. The government must also take the blame for failing to grasp a fundamental fact: poverty is to the war, what the world market for cocaine is to narco-trafficking. It is the motor driving the violence. There is no mystery about how to get rid of guerrillas and drugs. It only takes money. Then there is the stubborn intransigence of the FARC guerrillas, their obsessive reliance on their military machine and inadequate grasp of political and economic realities of the modern world--and of the complex, urban society with which they have been trying for 20 years to reach an acceptable political settlement. To be fair, it can never be forgotten that during the previous peace process in the '80s, the FARC took the risk of fielding a civilian political movement that was brutally eliminated. The FARC and all Colombia are now suffering the irreplaceable loss of the intelligence, political savvy and leadership of an entire generation. 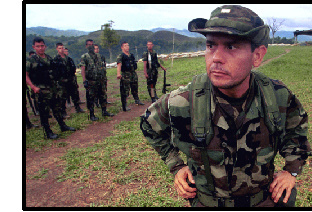 And, of course, the U.S. war on drugs and the fumigation campaign have done their bit to destroy the Colombian justice system and create a reservoir of recruits for the guerrillas. More recently, the inanity of U.S. policy in the Clinton administration, whose Plan Colombia program is well on its way to failure, has effectively unraveled the peace negotiations.